Any proclaimed hockey expert will tell you the goaltender is the most important position in ice hockey. The goalie is the last line of defense. If a goalie goes down, you're done, unless your backup is just as good, or better. So when last season's Washington Capitals made a huge trade from Montreal mid-season for Christobal Huet and in the subsequent 13 games he registered 11 wins, 2 losses, 2 shutouts, a 1.63 goals against average and .936% save percentage - don't you automatically prioritize his re-signing in the off-season, paying him 2nd to Alexander Ovechkin? Or for that matter, paying him whatever he wants (within reason, of course)? They didn't and he went to Chicago. Bye, bye Huet. Almost a year later, the Caps goalkeeping gave up game 1, forcing them to put their backup goalie in for game 2 and, mostly, providing forward momentum for the Broadway Ranger hopefuls. So now that the defensive and relentless New York Rangers have beaten the insecure and inexperienced goalkeepers of the Washington Capitals 2 out of 2 games in the first round of the playoffs (recap here), one must point to what could be, perhaps, one of the greatest Washington Capitals management mistakes in the team's history. Maybe getting rid of Jaromir Jagr to the New York Rangers post-lockout for half price was a biggie, but given the current situation they find themselves in, did someone in management ignore the basics of the game? An elite goalie needs to carry your team through the pressures of the playoffs. ( Although Jose Theodore apparently lacks confidence this first-series round, the masked man continues to display net-fulls of charisma for all to see - the George Hamilton of hockey) Good for New York. Theodore's performance in game 1 was atrocious and inconsistent, so Caps Coach Bruce Boudreau decided the 2nd game yesterday afternoon was better suited toward rookie backup goalie Simeon Varlamov. WTF??? Varlamov had prior played in 6 NHL games. What will Paris Hilton think of Theodore now? Cap's goalkeeper Varlamov was quite good in what was only his sixth career NHL start, but it turned out he had to be perfect in place of No. 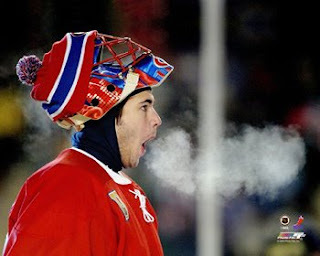 1 goalie Jose Theodore. Fortunately for us, Ryan Callahan spoiled Varlamov's surprising NHL post-season debut by scoring on New York's second shot Saturday, giving the Rangers a 1-0 victory over the Capitals. A first-round draft pick in 2006, the 20-year-old Varlamov began this season in the minors, but Washington coach Bruce Boudreau opted to give him a chance Saturday, after playing coy since Wednesday about who would be Washington's goalie. The Rangers with Henrik Lundqvist in goal automatically gave us the edge for yesterday's match (35 saves for his third career playoff shutout). He stole us the game, folks! Whew. The Blueshirts defense gave us one of their best Pink Floyd impressions as 'all in all, it's just another brick in The Wall'; Rozsival and Redden (hiccup) shutdown the offensive nothingness (at least for one game) of Alex Ovechkin and the rest of his Semin & Green posse'. We haven't seen blueline shutdown for many moons, so it is refreshing to see our overpaid veterans have a turn at teaching the young'ens Dan Girardi, Marc Staal a little or something about throwing yourself down into the puck (more than 15 shots blocked by the body yesterday alone). Overall, it was an inspiring and impressive performance for the Rangers. Monday night we have the surprising treat of opening our first home playoff game of the season with an impressive 2-0 games ahead of the Caps. At best, most of us were hoping to split the series with a 1-1 record, but this is a 'happy place' for Rangers' fans and it should light up The Garden brighter than we've seen most of the season. 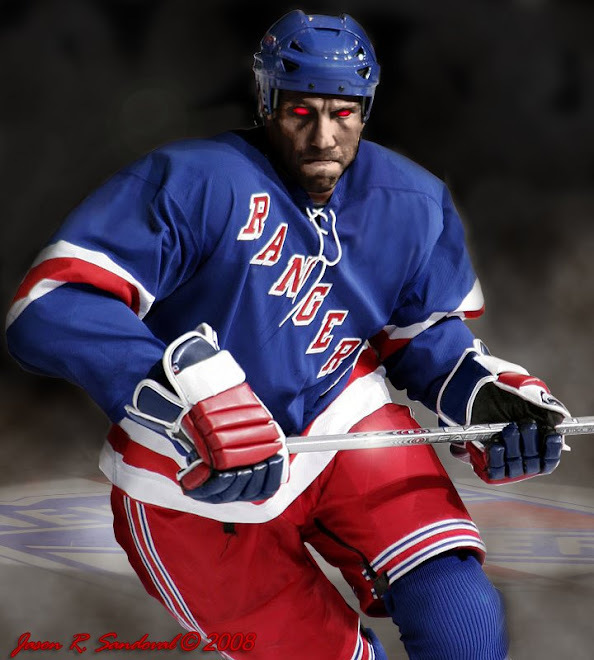 Dark, Who would of thought that the Rangers would take 2 in Washington? Lundqvist has been outstanding and the D has not allowed many "Second Chance" shots by the Caps. Looking forward to Monday night at MSG. It should be electric. I actually can't believe it. I should have just entitled this blog.. "OMG!!!! WE ACTUALLY WON 2 GAMES....YES, THE RANGERS...YES AGAIN, THIS YEAR'S RANGERS..."